I’m affraid that the module used to manage Album in my website is now realy too old and can’t be used anymore. So i’ve now switched to the Jamendo widged to promote last uploaded old and new album. 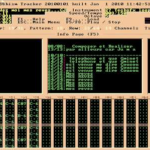 You’d be able to discover right now “Planer n’est pas jouer” with realy old sound track i’ve write with a PC 80386 ! I should now find a solution to present all albums in this webiste !